The InsulLiving® Home Builders Network is a database of residential builders around Australia willing to satisfy your sustainable residential building needs. These builders have been trained to use the InsulLiving® system; which has a diverse number of applications, from simple granny flats to impressive two storey homes. If you have a preferred builder who isn't already a part of the InsulLiving® Home Builders Network, Bondor® can provide training and continued support throughout the construction process with this unique product. The InsulLiving® system is a simplified, reduced construction process leading to a more responsible use of scarce skills and resources and the opportunity to provide meaningful work for less skilled workers. 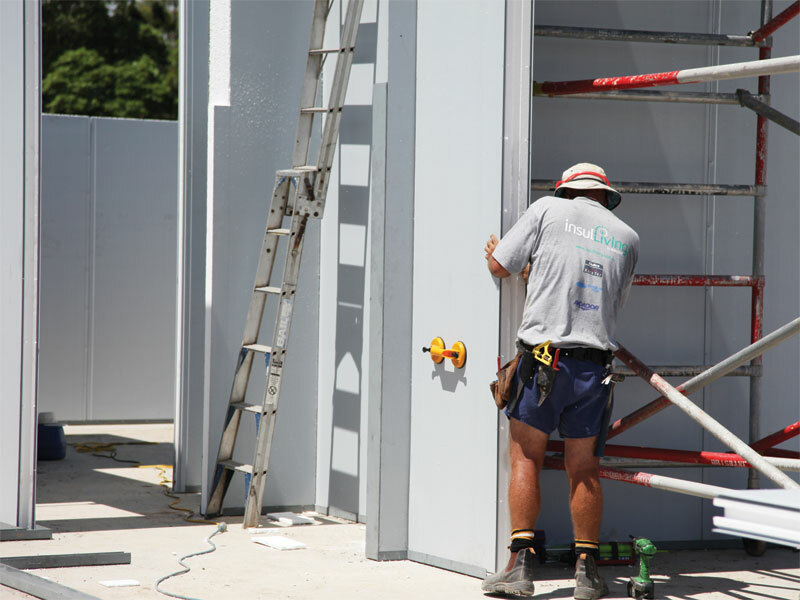 Insulated Panel Contractors are a team of builders highly experienced with insulated panels. They seek to deliver maximum performance and value within any application. Tenheggeler Homes offer a specialized service that is tailored to suit every client’s individual needs. We have a large range of plans to suit every type of family. We have been building quality homes in Gladstone for over 16 years, whether it is your entry level home, or your large dream home, we do them all. Contact us on (07) 4978 7335 to discuss building an InsulLiving home. Bryland Construction is locally owned and operated Townsville, servicing the construction needs of Townsville, Ayr, Charters Towers and the surrounding areas. This local business will look after you start to finish, the advantage of competitive pricing. Unique Style Homes build custom homes in the Illawarra area. They specialise in building new homes, no matter how difficult the site may be. Independent Builders Network is a professional network of local builders, working together to offer home builders a higher quality, more personal & better value for money service, than the impersonal volume project builders. Pure Eco Homes create healthy home sanctuaries, which are asthma and allergy friendly; as well as super energy efficient. This Victorian based company is the product of nearly 20 years of research into improving the quality of health within Australian homes. DTC Family Builders have paved the way for insulLiving® homes in Victoria. They will shortly have the second operating insulLiving® display home in Australia with an incredible 8+ star energy rating. G.E. Fleming Construction have over 25 years of building experience, and pride themselves on quality, passion and perfection. Based in Melbourne's Southern Eastern suburbs, G.E. Fleming Construction specialise in residential projects that are tailored to individual needs. Custom Green Constructions Adelaide’s specialists in building with Bondor’s insulLiving system. Design, engineering and building are offered in the service package to make building your project a breeze. New homes, Extensions, Outdoor Living. Australian Modular Homes Australian Modular Homes are the leading supplier of affordable modular housing solutions based in QLD. They offer a wide range of modular designs including granny flats, modular housing, offices, flat pack homes, studios, retreats and cabins. A1 Portables deliver upmarket temporary or permanent portable buildings built from quality materials that are completely insulated. The team at A1 are constantly developing portables to suit your needs. Evo Portables custom builds portable buildings for the Queensland climate, with your choice of panel colours, profiles, windows, doors, air conditioning, ceiling fans and more. From offices, to classrooms, this Queensland business is flexible enough to service your needs. Emjaro Mod Pods specialise in the construction of versatile and affordable modular buildings using modern lightweight panel. Emarjo offer a huge range of sizes, unlimited options and configurations, coupled with a highly competitive price. Multidwell have developed designs modular in nature, using the InsulLiving® system that provides certainty in cost, installation time and quality. Multidwell are registered builders and, unlike many other granny flats, all of their units come with a seven-year home owners warranty. Aussie Modular Solutions (AMS) is the awarding winning Modular experts of Western Australia, who specialise in transportable modular homes and buildings. AMS engineers, designs, manufactures, transports and installs modular buildings and prefabricated modular homes for the mining, resource, commercial and residential sectors. G&T Developments is a Launceston based building company that specialises in not only new homes, but also renovations/extensions, fit-outs, building maintenance, roofing, fascia and guttering.G&T Developments are proud members of the Independent Builders Network, and Steve acts as Chairman for the Launceston Zone. For more information contact Tim on 0488 455 122. Tassie Homes has recently expanded their horizon, by moving towards the construction of pre-manufactured homes in their Building Centre. This is offered along with traditional builders, building a home on site from beginning to completion.